How is it that we spot and claim certain styles as an official trend? Probably because we follow every major influencer in the biz. When a new trend comes around, it's only a matter of seconds before girls like Reese Blutstein and Alyssa Coscarelli flood your feed with their iterations of whatever it is that's causing all the sartorial hype. This summer, the one outfit It girls from all around the world are wearing bike shorts with blazers. The combination seems odd at first, but once you see how these girls are styling bike shorts for summer, it will all make sense. In general, combining two unexpected articles of clothing together has a major capability of producing a standout look. A blazer, a staple piece in anyone's wardrobe, paired with an extremely hyped-up trend like bike shorts? It's a surefire win in this day and age, and it's no surprise fashion's favorite It girls were the first to test out the duo. 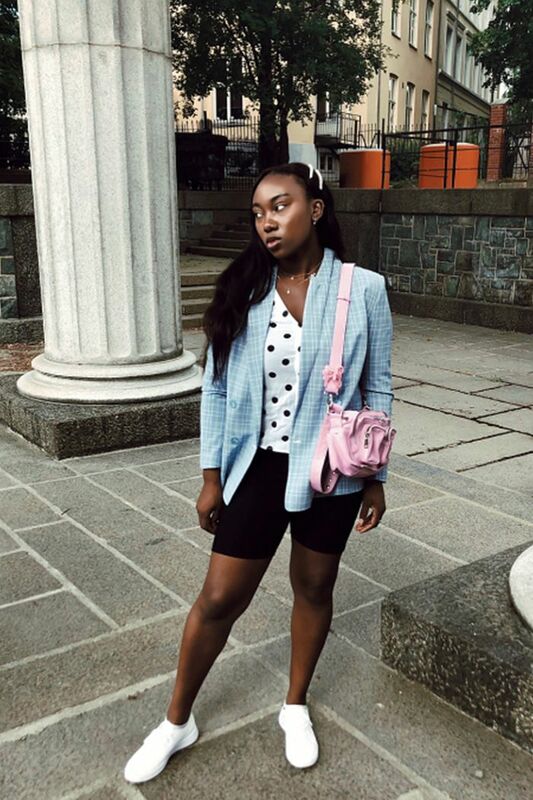 Ahead check out some of our favorite summer blazer–and–bike short outfits while shopping the pieces you need to re-create the look, which we highly recommend by the way. Mix pastels with a classic print like polka dots if you're looking for a more playful way to take on the biker short trend. White sneakers and pearl barrettes are the cherries on top of this look. Available in sizes XS to L.
If you have more classic style, opt for a black blazer–and–black bike short duo. Throw on some chunky sneakers for one "trendy" element and layer a basic button-down underneath. Available in sizes 2 to 10. Available in sizes 2 to 12. Calling all fashion risk-takers: This look's for you. Go full athleisure underneath with a matching set that features bike shorts and a sports bra and business on the top with an oversize plaid blazer. Available in sizes XS to XL. The easiest way to make a T-shirt feel cool this summer is by layering a structured blazer atop and by wearing biker shorts on the bottom. Feeling a little crazy? Then go bold with your footwear choice by wearing both colored socks and sneakers. Classic style meets the bike short yet again. When paired with a crisp white blazer and strappy yet simple sandals, you hardly even realize the bike shorts… in a good way. Available in sizes 6 to 14. Last but not least, we present to you the coolest way to wear all your favorite pieces at once. This outfit proves you can simultaneously wear a blazer, a romantic dress, bike shorts, and statement boots all at once and make it look great. Available in sizes 1X to 4X. Next up, shop more bike short outfits for summer.